This blog is part of a series of posts that focus on Nature’s organizing principles. The material in each of these posts has been condensed from the text of my new book entitled “Nature’s Patterns: Exploring Her Tangled Web“. The book will be published in both an Amazon Kindle edition and a soft cover edition in September of 2014. “In biological systems self-organization is a process in which pattern at the global level of a system emerges solely from numerous interactions among the lower-level components of the system. Moreover, the rules specifying interactions among the system’s components are executed using only local information, without reference to the global pattern — Scott Camazine “. Of all the distinctive traits of collective animal behavior, the most conspicuous and spectacular is the emergence of group order where individuals within the group, as if by magic, synchronize their behavioral state with each other. This collective response is the way a group as a whole can interact with its environment. 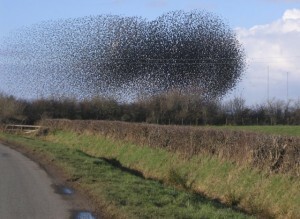 The spectacular video of starlings in flight is an example of the collective behavior known as “self-organization” or “emergent behavior”. It is well known that individual organisms within an ecosystem may interact and exchange energy locally by mechanisms such as attraction and repulsion, the exchange of biomass, flow, chemical compounds, information exchange, or other forms of signaling. These processes can produce phenomena at higher levels such as aggregation into insect colonies, animal herds, fish schools, bird flocks, or cities. These higher level phenomena, sometimes called collectives, include the seemingly spontaneous organization into unexpected structures. These collectives can then achieve status as super-organisms, whose behaviors may not be a consciousness in the whole but may be described as if they were. 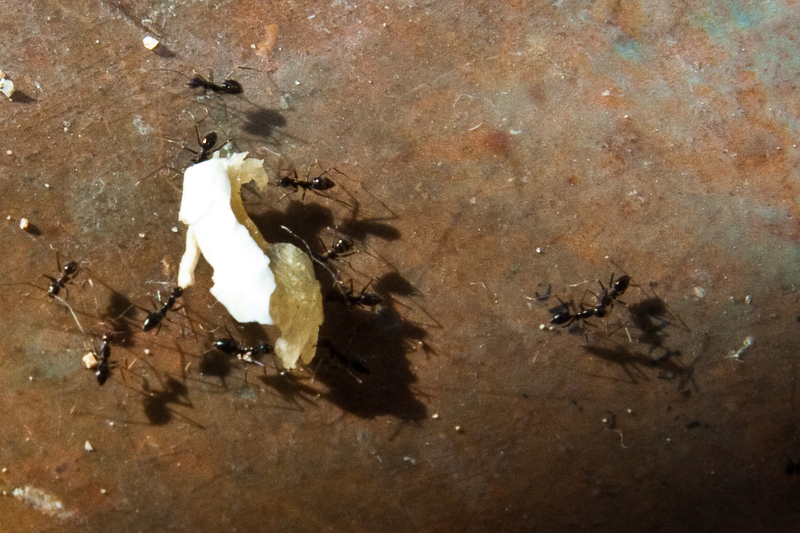 Groups like ant colonies and bee hives are sometimes viewed as super-organisms whose manifestations result from the behaviors of individuals within the group. This phenomenon of self-organization, where a system all by itself becomes ordered in space or time, often leads to emergent properties that are very different from those of the individuals within the group. Using the available energy delivered through Nature’s connections, how do large scale behaviors of groups in an ecosystem emerge from local interactions among individual agents within the system? What are the processes that utilize energy to produce operating ecosystems at any and all levels? To help us with these questions, we first turn to the field of physics to explore the ideas of energy flow in closed systems and in open systems. A closed system is a physical system that does not interact with its environment or other systems. A diamond crystal is a closed system that does not exchange matter or energy with its environment. An open system, while usually separated from its surroundings by some boundary such as a membrane, permits the transfer of matter and energy across that boundary. The cells in our bodies are open systems. There is an ongoing transfer of energy and/or matter across our cell membranes. The movement of energy and matter is required to keep the cells alive. This energy is supplied from some source in the surrounding environment, such as the sun. Self organizing systems, like groups of cells in our bodies, bird flocks, animal herds, fish schools, and ant colonies are open systems that receive and transmit a constant flux of energy and matter from and to their outside environment. Through self organization, a system becomes ordered in space or time, often leading to emergent properties that are different from those of its individual parts. Unlike closed systems which are always in equilibrium, self organizing systems are open systems that operate far from thermal equilibrium and rely on a continuous flux of energy and materials that is delivered from the outside by their connections with the system’s boundaries. Intuitively, the idea that a self organizing system is an open system can be visualized when one considers that a fish school continually receives food energy from its surrounding environment as it moves through the water. The bottom line is that a self organizing system requires constant energy flow in order to exist. With a foundation of connectivity and structured energy flow solidified in our thinking, we are now going to explore how Nature’s complex systems “self-organize”. While not the only way that Nature becomes organized, self-organization is so common that we regard it as an operating principle of Nature. However, to be complete in our thinking, we must briefly examine other methods that Nature uses to organize herself into patterns that we can easily recognize. These other methods of pattern formation do eventually become involved in the process of self-organization. What all of these pattern formation methods have in common is that they are all ways to formulate structures that are conduits for energy. This discussion of Nature’s pattern formation methods comes partly from authors Scott Camazine in his book “Self Organization in Biological Systems” and Kevin Kelly in his book, “Out Of Control”. Answers to the question about system forming mechanisms is very complex. Rather than get bound up in unnecessary detail, it is wiser to talk about a range of possible system forming processes. This range is bounded by two extremes. 1. A well informed leader who directs himself or a group. Any system that promotes synchronization will benefit from a leader. 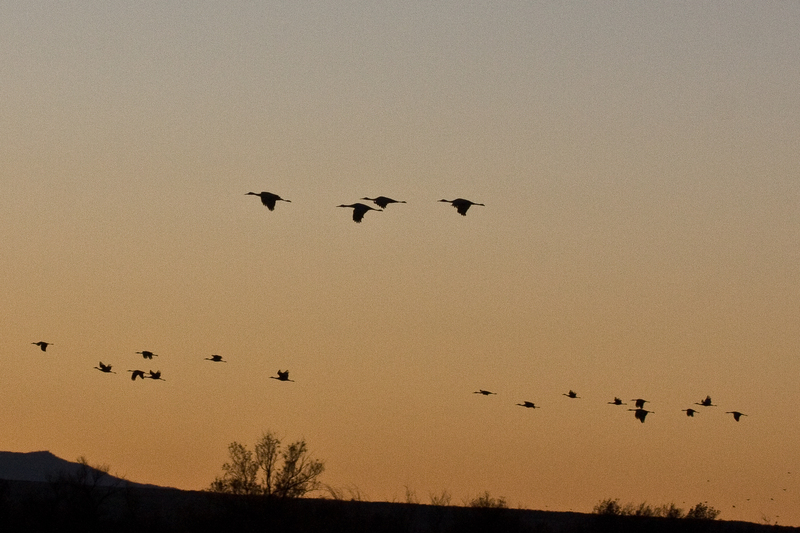 An example of sequential pattern formation using a well informed leader is the queuing of young geese behind their mother in flight. It is thought that it is the “follow the leader” process that imprints the migratory route into the behavior pattern of the young geese. From birth, they imprint to their mother and follow her over the route the first time. 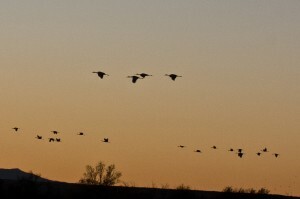 “Fly Away Home” [ http://www.imdb.com/title/tt0116329/ ] is a wonderful movie that portrays this process. 2. A blueprint is a pictorial set of physical instructions or perhaps ingrained “instinct” that shows what is to be built. A blueprint example in Nature is the genetic or cultural imprint of a bird’s song that specifies tonal and temporal relationships. 3. A recipe is a set of sequential instructions. Camazine notes that recipes specify how something is to be built. A spider creates its sticky orb following a genetically determined recipe for laying out the various radii and spirals of the web. 4. Templates are a full sized guide or mold specifying the final pattern. A weaver bird uses its own body as a template as it builds the hemispherical egg chamber of its nest. 5. Stigmergy is guidance based on response to stimuli from the product of work previously accomplished. Worker termites are thought to practice stigmergy. In the presence of certain configurations of a mound’s construction the worker is stimulated to a high degree of activity, and will add building material to specific parts of the construction. More than one sequential activity may be simultaneously employed. For example, a blueprint can be used by a leader to create a certain pattern. At the opposite extreme of sequential processes is self-organization. 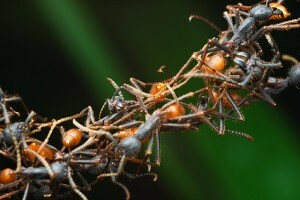 The self-organization of a complex system or a super organism with a unique behavior results from a network of many individuals each acting independently but following the same set of behavior rules that tell each individual how to respond to the relationship with its nearest neighbors. Instead of being tied to a master clock, a leader, a blueprint, a recipe, a template, or to stigmergy each individual acts independently and behaves by applying an inbred rule set as necessary. The rule set establishes criteria for performing an action. The creature’s feedback system assesses the results of the action and reapplies the rule if necessary. Because non-linear feedback mechanisms are employed, self-organized systems are complex systems that behave in unexpected ways which are not predictable from the behavior of their members. This process is ubiquitous in Nature. From atoms to galaxies, self-organizing complex systems are present all around us. Matter began to self-organize itself within a fraction of a second after the big bang that initiated our universe. Quarks coalesced into protons and neutrons. When a proton could capture an electron, hydrogen formed. The self-organization of atomic nuclei continues within stars as hydrogen nuclei are fused into helium nuclei and the hydrogen core shrinks. These stellar interiors heat up as energy is released from nuclear fusion reactions. Carbon nuclei form in that moment when two helium nuclei are briefly forced together and are struck by a third. An oxygen nucleus forms when carbon is struck by another helium nucleus. The ordering principle that leads this self-organizing process of nuclei production is called stellar nucleosynthesis. The process continues within the stars. Oxygen nuclei are bombarded by other nuclei and it is transformed into silicon and sulfur. More fusion accompanied by the decay of some unstable combinations produce different nuclei all the way up to iron. At the atomic level, the Pauli exclusion principle is a rule set tells us that no two electrons can have the same set of quantum characteristics in an atom at the same time. Therefore, only 2 electrons of opposite spin can exist in the lowest energy level of an atom. Other electrons fill successively higher energy levels in orbitals governed by this exclusion principle. What results is the basic self-organization of Nature’s chemical elements according to definite patterns. The natural outcome of the self-organization of the atoms is the emergence of the order that we see in the Periodic Table of the Elements. With this, we see why and how atoms self organize into molecules and how molecules eventually become Nature’s organic and inorganic matter. The case of Pauli’s exclusion principle is important because it shows how an extremely simple “principle of organization” works. That principle is a physical law that accounts for the existence of a great variety of natural patterns. Self-organization seems to proceed according to natural laws or fixed sets of rules. At the macroscopic level, the behaviors of many social insects are examples of this process. Individual insects generally do not have the cognitive power to generate their observed complex structures and activities. The construction of termite mounds, ant walls, honey bee comb patterns, wasp nests, honey bee thermo-regulation, army ant swarms, ant corpse-aggregation, and foraging in ants and bees all take place by combining simple rules at the individual level to produce a complex global response without any external direction. Other organisms also display this autonomous order. Fish move in concert, organizing themselves into schools. Birds and animals flock or herd in a similar manner. Cells of living plants and animals combine to create highly structured tissues. Nonliving examples of self-organization include sand grains assembling into rippled dunes and natural magnets that align themselves into a common North-South orientation. Crystals can form from liquids showing a spontaneous increase in order. No amount of mathematics or human logic can predict or reproduce this phenomenon. Only the actual playing out of the rule-based behavior of each individual will produce a picture of the system. The collective result is a complex system with a behavior that is greater than the sum of its parts. Cohesion – Move toward the average position of my nearest neighbors. Alignment – Move in the same direction as my nearest neighbors. Separation – Maintain a minimum distance from my nearest neighbors. Predator Avoidance – If a predator gets too close, move away from him. Obstacle Avoidance – If I get too close to an obstacle, move away. It is the combined actions of all of the individuals using their internal feedback mechanisms, that result in the emergent behavior of the fish school. The same process applies to bird flocks and animal herds. The phenomena of self-organization is one form of proof that Nature is inter-connected and interdependent. Connectivity of some sort between an individual’s nearest neighbors is essential if emergent behavior of a group is to exist . 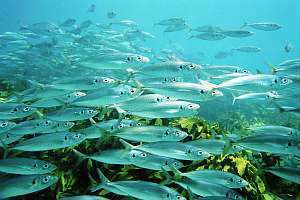 In the case of fish schools, the connection between individual fish is the effects of each individual’s sensory organs that define proximity. Connections are also made by individuals with their environment. 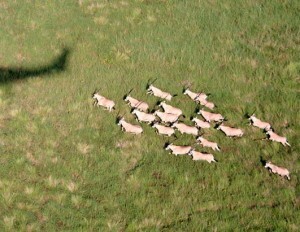 This results in such activities as predator avoidance and connections with food sources. The formation of Nature’s complex systems are unpredictable even though the underlying mechanisms at an individual level are understood. We see both chaos and order. The emergent behavior of a complex system equals more than the sum of the parts. The breathtaking picture of living emergence comes from the flocking behavior of Starlings that are portrayed in the video noted at the beginning of this blog. The individual birds fly while employing ingrained rules that separate themselves from their neighbors. However, the appearance and behavior of the flock tells us nothing about how each individual bird is behaving. The bird flock constantly changes shape as it responds to the actions of a predator. Yet, the behavior of the flock is defined solely by the actions of individual birds who are each following a set of inbred flying rules that relate only to keeping a certain distance with respect to each of their nearest neighbors, obstacles, and predators. You could never add up each of the individual bird’s actions to define the form and behavior of the airborne flock. This is characteristic of a complex system. Hierarchal structure is an important part of a self organizing complex system. The various levels within a complex system can exhibit their own unique self-organization and emergent properties. Each level helps form the next level of connected structure in the system with different emergent properties. In bird flocks or fish schools, the self organizing hierarchy begins with the cell chemistry of the creature, then its organs, then its behavior, and finally the society of organisms that form the group. Because of the hierarchal nature of self-organizing systems, it is important to note that portraying self-organization with one small part of the entire system cannot give us the whole picture. The phenomena of “preferential attachment” is a common explanation for the formation of self organizing groups. This means that the more popular something is, the more likely it is that a new object will link to it. If you were to buy a book online, you would “prefer” to go to Amazon instead of to my web site. Creatures in an ecosystem may “prefer” a certain kind of food and will tend to go where their prey exists. The krill in the Southern Ocean, being preferred by many species, is an ecological example of preferential attachment. The process of a fish joining a school is an act of self organizing preferential attachment at one level of hierarchy. The process of swimming with the group while using the separation rules is another level of preferential attachment. The big difference between systems driven by centralized or directed behaviors noted earlier and self-organized systems is not the amazing order that we might see. Instead, the trademark of a self-organized system is that there is no leader. With systems that exhibit centralized behavior, where there is a leader, everyone moves in the same way as the leader moves. The leader defines the group’s order. There is no communication from one individual to the next. Therefore, any individual behavioral fluctuations are independent. Only if the leader detects a predator will the group take defensive action. And then, the action must be defined by the leader. Unlike a system with a leader, the real signature of a self-organized group is collective response. Any individual can independently respond to a stimulus such as a predator. The entire group will then collectively respond. It is this collective response that results in the emergence of a systematic behavior. Emergence is the way complex systems arise out of relatively simple processes, instructions, or interactions. It is a recursive action of each individual interacting with others that results in the emergent behavior and organization of the group. The next time you view a bird flock, think about the leaderless behavior that forms the beautiful movements of the group. Let your feelings of awe and wonder take over as you realize that your very body and being operates much like that flock. Based on one of your previous posts I obtained a copy of Strogatz’s book and was excited to learn that the firefly phenomenon can be viewed in the U.S. Thanks Daphne for pointing out synchronous behavior. If you can, please tell us where and how firefly phenomena can be observed. I find your comments very interesting. For years now, I have had an interest in studying self-organization. It results largely from my reading of materials from the Santa Fe Institute, especially the writings of Stuart Kauffman. Of particular interest to me is the formation and defense of belief systems. It is my belief that what people believe and who they are is dependent on factors such as parentage, country born into, and life circumstances and experiences, factors over which we have no choice. I think self-organization plays a role. And I think if more people were to believe this way there would be more tolerance of others and less demonization. Hello Richard: Thank you for your comment. I am particularly interested in the formation of world views that drive each of us. In particular, those world views that define how we humans impact the environment and sustainaboloty. Otangelo: Thank you for your comments !!! !